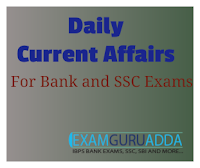 Dear Readers, we are presenting Daily Current Affairs for All Exams- 2nd December 2016. 1. The Government has, on the recommendation of the Reserve Bank of India, decided to sharply up the ceiling for issue of securities under the Market Stabilisation Scheme (MSS) to ₹ 6 lake crore from Rs 30,000 crore. 2. This is to facilitate liquidity management operations by the Reserve Bank of India in the current scenario, whereby banks are receiving copious deposits following demonetisation of Rs 500 and Rs 1,000 bank notes. 3. MSS issuance may set the stage for withdrawal of incremental cash reserve ratio. 4. After the withdrawal of the legal tender character of the Rs 500/1,000 denomination notes with effect from November 9, there has been a surge in deposits with the banks, the Reserve Bank said in a notification. 1. Chitra Ramkrishna has resigned as the MD & CEO of the National Stock Exchange. 2. The board of NSE has appointed J.Ravichandran, Group President, to hold charge of the office of CEO with immediate effect. 3. The board also decided to immediately start the process for selection of a new Managing Director & CEO and has set up a selection committee for this purpose. 1. Vittiya Saksharata Abhiyan (VISAKA) was launched by the Union Ministry for Human Resource Development (HRD) to make people aware about cashless economic system. 2. It was launched by Union HRD minister Prakash Javadekar in New Delhi. It is campaign by Higher Educational institutions for digital economy. 1. The second Indian Council for Cultural Relations (ICCR) Ideologist Award for the year 2016 was awarded to Prof. Yu Long Yu of China. 2. He was presented with this award by President Pranab Mukherjee at a function in Rashtrapati Bhavan, New Delhi. 1. TeamIndus, a private aerospace starup company is planning to send a spacecraft to the moon aboard an Indian Space Research Organisation (ISRO) rocket on December 28, 2017. 2. It will be India’s first private moon mission to be launched. It will be launched onboard of ISRO’s workhorse Polar Satellite Launch Vehicle (PSLV). 1. The United Nations Educational, Scientific and Cultural Organization (UNESCO) has formally inscribed Yoga in its representative list of Intangible Cultural Heritage of Humanity. 2. Decision in this regard was taken by the Inter-governmental Committee for the Safeguarding of the Intangible Cultural Heritage meeting held in Addis Ababa, Ethiopia. 3. The declaration describes Yoga, an ancient Indian practice as a Human Treasure. It was unanimously supported by all the 24 members of inter-governmental Committee.